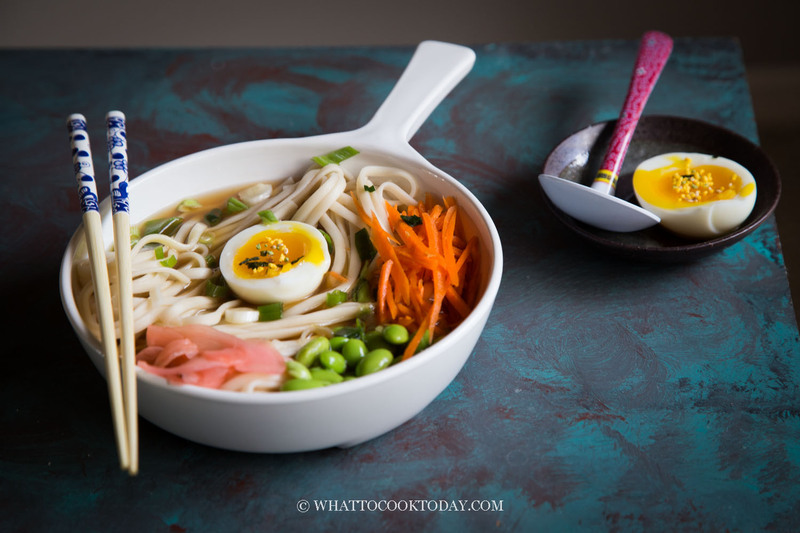 Amazingly Refreshing Cold Udon Noodle Soup – Tame the hot summer days with this refreshing and super easy cold udon noodle soup that you can slurp without breaking a sweat. The summer may not be officially here yet, but boy has it made its warm humid presence here in the land of 10,000 lakes. The floor feels sticky and I am hesitant to turn on the oven and do any elaborate cooking in this sort of weather! I feel irritable LOL! I still love summer though. 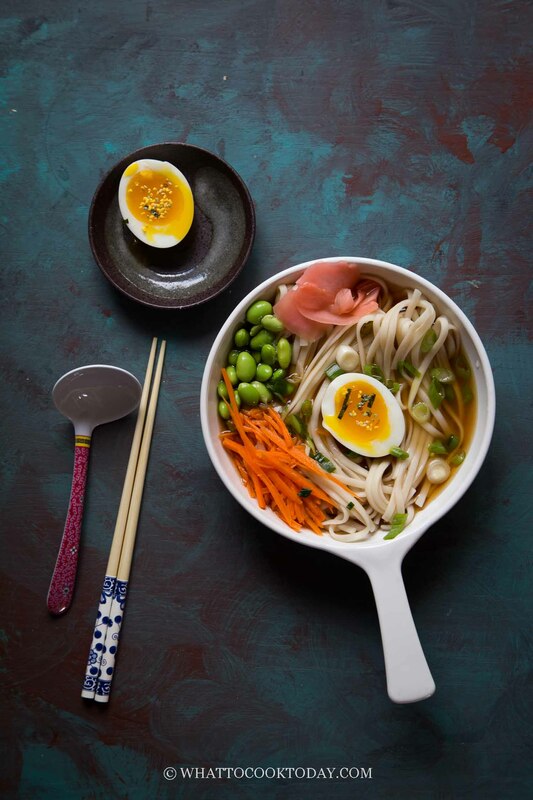 This amazingly refreshing cold udon noodle soup is one of our summer staples. It’s super easy to make and have I said that it’s refreshingly cold? Yes, it’s a remedy in this humid sticky weather! 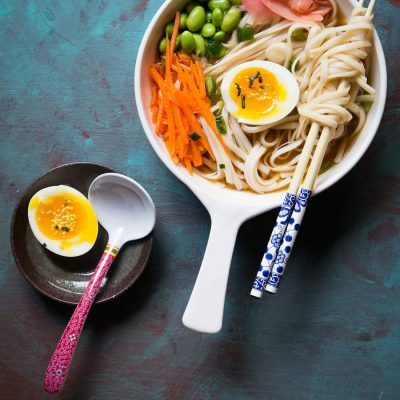 You may see some ingredients that you may be unfamiliar with, but they are all can be easily found these days as many non-Asian grocery stores may even carry these ingredients too. 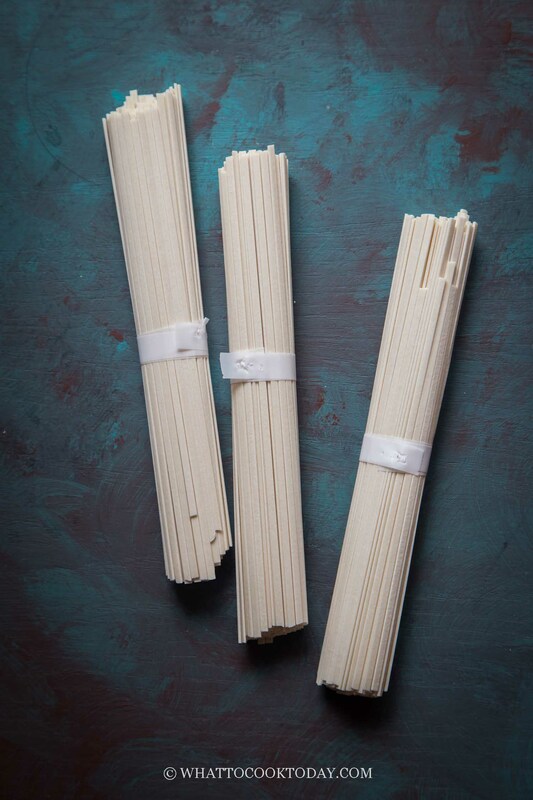 You can buy a store-bought dashi, but making your own dashi is so easy you won’t believe it. You only need 2 ingredients: Katsuobushi and Kelp (Kombu seaweed). No long cooking required to make the stock. Mirin is Japanese sweet rice wine. It has low alcohol content. The fermentation process of the wine creates a sweet taste to the rice wine. Its addition to the cold broth in this recipe is to lend some sweet and light rice wine aroma. This is a thinly sliced young ginger that has been marinated in sugar and vinegar. The pink color often seen when you use very young ginger to pickle. 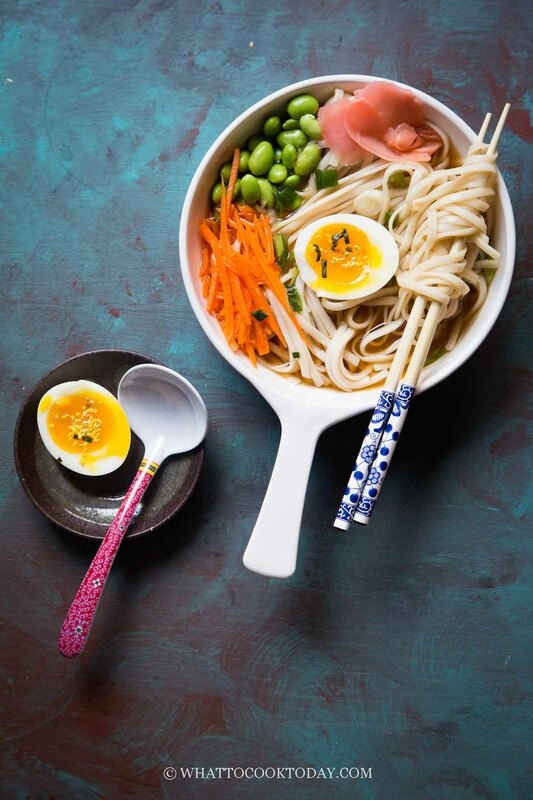 WHAT TYPE OF UDON NOODLES TO USE? I use dried udon noodles. 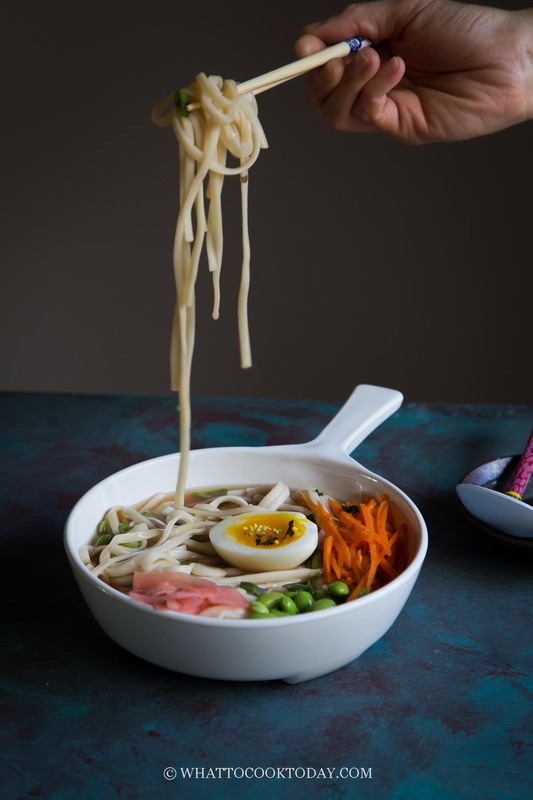 You can use store-bought instant udon noodles too, which take 1-2 minutes to cook, much faster than the dried udon noodles. 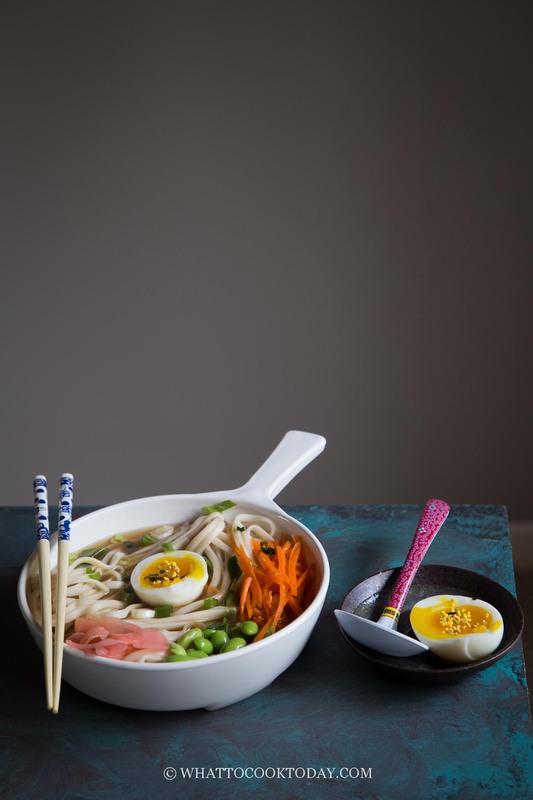 I don’t have the photos because my kids don’t like the instant udon noodles for some reason. When you have things prepare ahead, putting it together is really as easy as 1-2-3! Do you think use the fresh pasta will work with this recipe as well? Now this is the perfect summer meal. It’s already hot here in San Diego and I hate turning on the oven. and my electric bill hates the air conditioning. And I’ve been hot and sweaty for days. But I also love summer!! 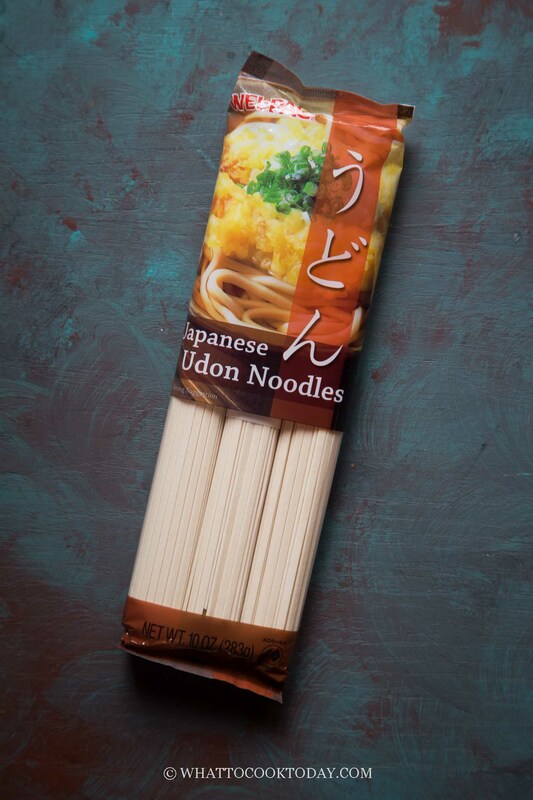 I love using the instant udon noodles, I’ve actually never even tried the dried. I might try them just to see the difference. Those eggs look amazing too….